The Mac OS X social sharing features on the Mac platform let you quickly publish images and videos to a variety of places. Using Share Sheets within QuickTime Player you can even publish videos directly to YouTube, Vimeo, and Facebook, right from the app. This is very fast, and offers a quick way to share or upload videos to a variety of social sharing sites without having to leave the Mac or use a web browser. Here’s how this works for YouTube, Facebook, and Vimeo. A progress bar indicates how long it will take to upload and publish the video to the chosen destination, and the entire process is handled by QuickTime Player, you don’t need to go to the destination websites at all. Sharing directly from QuickTime Player gives you options that aren’t otherwise there in the Finder with Quick Look’s Sharing Sheets, like YouTube and Facebook. 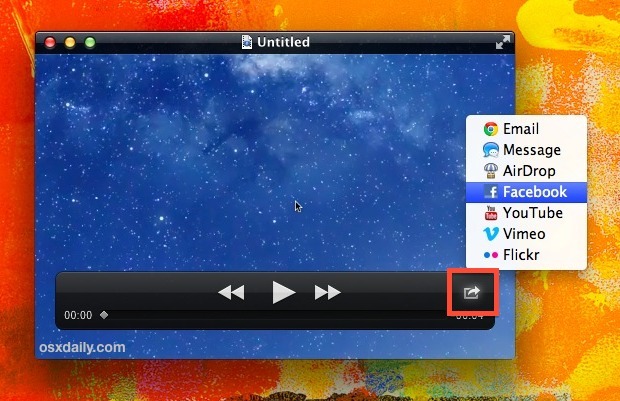 Note that this feature is widely supported in all modern versions of OS X, as Facebook integration arrived officially in Fall of 2012 with OS X 10.8.2 alongside the iOS 6 release on September 21 of the same year, nonetheless it’s interesting to see it was already there in QuickTime Player before those releases. It’d be great if all those options were in the Finder sharesheet because it’s a lot quicker to share from there then opening an app. Assuming 10.8.2 will fix that, and hopefully include YouTube in the group as well. Its great to have the Share function in quick look too. No doubt Facebook will be added to the list soon. Now if only they would allow sharing to the cloud, life would be so much easier. You hearing me Apple? can i re download quicktime x if so how and where from pls, as i downloaded mountain lion from app store???? ?